Auditions can be a nerve-wracking business, especially if you’re new to the voice over industry. Nobody really relishes the idea of being judged, and that’s exactly what is going on in an audition. However, there are a few things you can do to make the process a little smoother and help ensure success. Try these tips to help you nail your next try-out! 1. Drink water until you feel like the human equivalent of the Hoover Dam. Don’t laugh, I’m serious. I can’t stress enough how important proper hydration is in voice over work. Dry mouth will come across loud and clear when you’re reading into a mic, and it’s doesn’t sound good. Drink plenty of H20 in the hours leading up to the audition, and take a bottle of water with you to sip on. 2. Get familiar with the script. There’s no telling how much time you’ll have to familiarize yourself with the copy, but take advantage of whatever you have. Quickly skim through the script so you have an idea of what you’re reading, then read it through again, this time with a pencil to jot down some notes. During this second read-through, "mark" your script with (cues) any ideas that come to mind while reading, such as which words to emphasize, where a pause might be good, etc. Having these notes can come in handy when you’re behind the mic and reading for others. 3. Warm up. Just like any instrument, it’s always a good idea to warm up your voice prior to an audition. 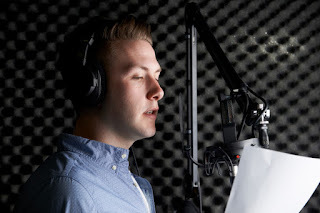 This doesn’t mean you have to be that person strutting around the lobby doing vocal warm-ups, but you do need to get your voice ready to go before heading into the booth. Warm up at home, in the car, on the subway, wherever - just make sure you do so your sound is on point. 4. Let your shining personality shine through, and don’t be afraid to be yourself! Most prospective clients want to see a bit of personality, and it will help you stick out in their minds later on, too. Approach the copy with perhaps a different mindset than what was actually stated in the script so you can perform it with a twist that many other talent may not think of. Be bold and just give 'em something they may not have been expecting in your read!